BuzzFeed has posted the documents showing Michael Cohen and Felix Sater organizing a Trump Tower deal until June 14, literally as the news of the DNC hack broke. The documents show how closely those negotiations interacted with the June 9 meeting. The Trump Tower meeting between Don Jr and Russians promising dirt was scheduled for 4PM (Rob Goldstone posted on Facebook that he was at Trump Tower at 3:57). Natalia Veselnitskaya ran a bit late, but they would have started the meeting by 4:10PM. Four witnesses to the meeting (the four whose responses weren’t coached by Trump Organization lawyers) said that the meeting ended with Don Jr saying that his father might or would revisit Magnitsky sanctions if he became President. The meeting lasted somewhere between 20 and 30 minutes. 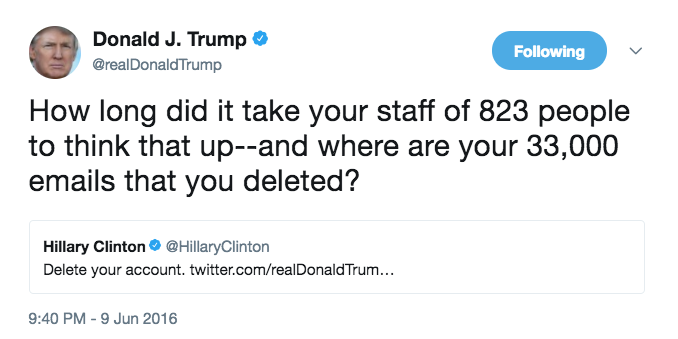 At about that time, Trump tweeted out a reference to Hillary’s emails, invoking 823 staffers, which was a good ballpark estimate for how many staffers (including unpaid advisors) she really had at the time. 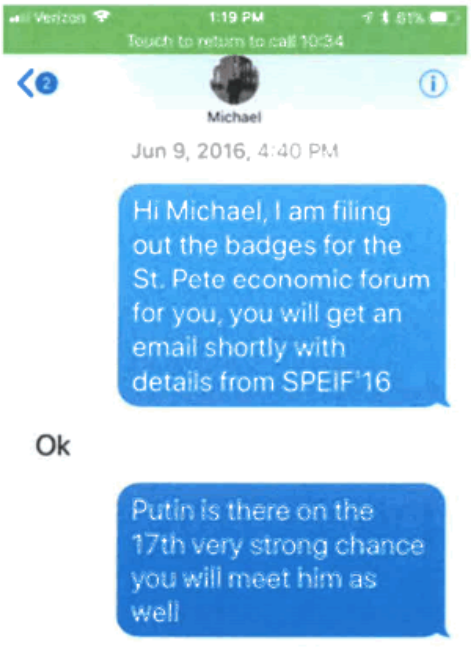 At that same time, Felix Sater texted Michael Cohen to tell him he was working on setting up Cohen’s trip to St. Petersburg. At that point, Sater told Cohen there was a “very strong chance” he would meet Russia’s President, which Cohen and Don Jr would have both believed meant that the Trump Organization could make $300 million by lending Trump’s name to the tallest tower in Europe. 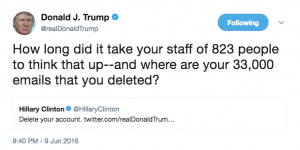 Quid pro quo, all executed on social media.